I’m thinking of getting a cat. What will I need? When you bring your new cat home, it’s a good idea to introduce them to a smaller space first, for instance a bedroom. Don’t worry if your new furry friend hides at first. Some cats are confident and will explore at once. Others need some more time. Get a horizontal and a vertical scratcher – there are cheap ones made from cardboard and it doesn’t have to be a huge initial investment. Some cats prefer to scratch one way over the other, and others like both. Providing scratchers will prevent problems with your kitty scratching on things they shouldn’t touch. If you do get problems with scratching, you might need to trim your cat’s nails. Cats who live indoor only don’t wear their nails down. For optimal kitty enjoyment, place the water bowl and food dish in different parts of the room, or even in different rooms. Cats love fresh water and often avoid water placed close to their edibles. This is because in the wild, water located close to food may be contaminated. Most cats prefer shallow bowls that are pretty wide. This is because they like to eat and drink out of something that doesn’t affect their whiskers. Ceramic or stainless bowls are the best. Some cats get acne from plastic bowls. If you have more than one cat, get one litter box more than the number of cats. That is, if you have two cats, get three litter boxes. It will help them feel confident and prevent problems. Prepare before picking up your new cat. Choose a quiet room and cat proof it by checking for things that can be dangerous. Examples include string, yarn, rubber bands, paper clips, needles, pins, and plants toxic to cats. Lilies are among the most dangerous plants for cats. When you come home, spend time in the room with your cat. Sit on the floor, speak softly, and offer treats. 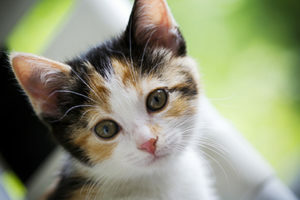 If you have other pets, give your new kitty some time to get comfortable in the new environment before introducing them. Be patient – cats can take up to a year to decide if they like something or not. If your cat is to be indoor/outdoor, wait for at least a week or two before letting them outside.